In Malaysia, we have a wide variety of street food to feed every craving. From main meals to small bites, our street food is extraordinary and loved by everyone. Come and learn how to re-create some of these street food recipes in your own home. In this class, you will learn both sweet and savoury “Pasar Malam” (Night Market) bites. 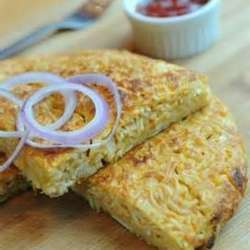 The Murtabak Maggi will be using spring roll skin instead of the usual roti canai as the pancake. Yummiliciously good! NOTE1: Adults attending this class are NOT allowed to bring children to the class unless the child is a participant in the class. Students are required to bring a RED Apron and containers to take away what they have prepared for the day to let their friends and family try.